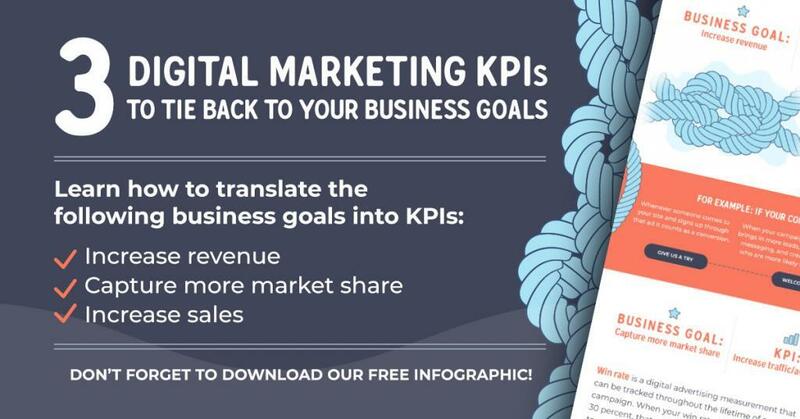 Although it’s one of the most common advertising pricing models, calculating your advertising campaign CPMs can still throw even the most seasoned digital marketers for a loop. We want to make it a cinch for you and your team to get up to speed on all things CPM. 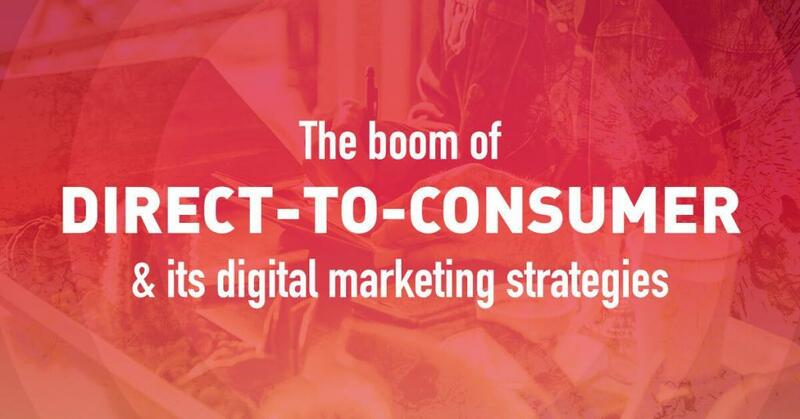 This digital marketing guide to programmatic bidding is meant to outline what CPM is and what goes into it, provide a marketing CPM cheat sheet you can download and keep on hand, and tie it all together with an interactive calculator to tell you possible CPM costs, campaign costs, and total impressions. 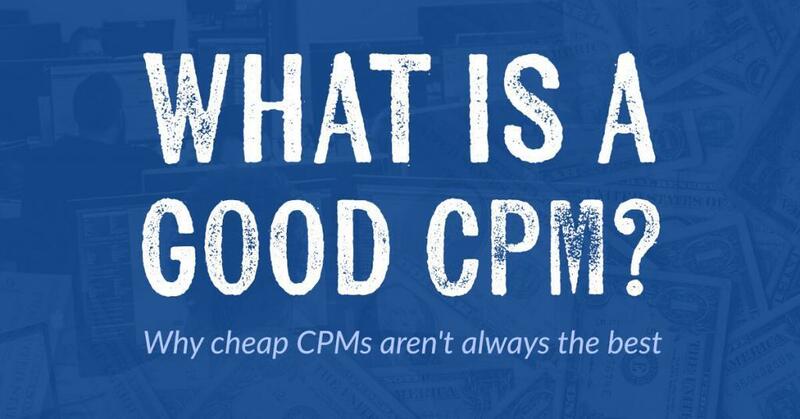 Marketing cheat sheet: What is CPM? Since programmatic advertising is conducted in an auction environment (AKA real-time bidding), the CPMs set by the advertiser during ad group creation is your base and maximum bids in the ad auction. CPM, or cost per mille, is the price you pay for every 1,000 impressions. Cost-per-thousand (CPM): A marketing term used to denote the price of 1,000 advertisement impressions on one web page. The M in CPM stands for “Mille,” derived from the Latin word for 1,000. The higher your base CPM, the greater the chance that your ad will appear. Heightening the threshold for your bid parameters expands your opportunities for winning RTB auctions. The best part is the ad exchange will charge you only what is needed to place your ad above the next highest ad. Data CPM, or the cost to utilize audience data to find targeted prospecting or look-alike audiences. Media CPM, or the cost-per-thousand impressions to serve the advertisement when your winning bid matches your campaign, ad group, and creative parameters. 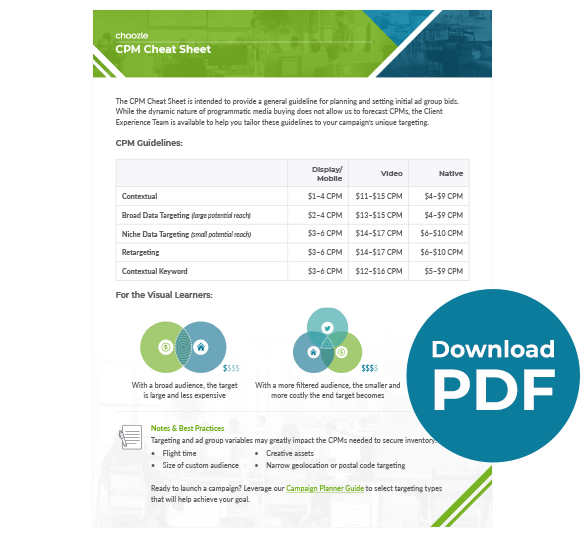 Download our CPM cheat sheet. The CPM cheat sheet is intended to provide a general guideline for planning and setting initial ad group bids. 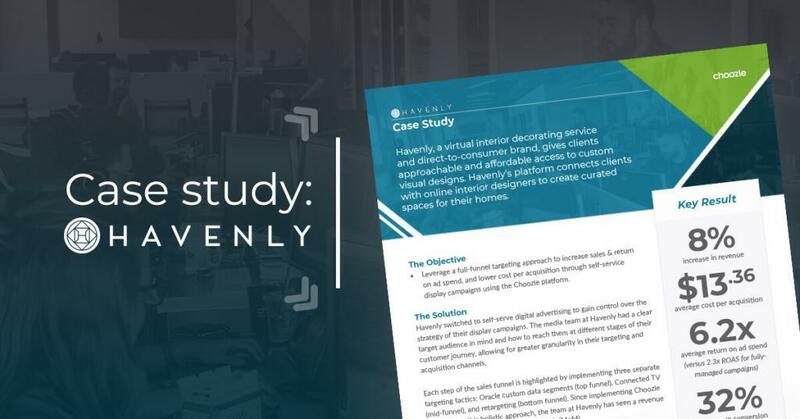 While the dynamic nature of programmatic media buying does not allow us to forecast CPMs, our Client Experience team is available to help you tailor these guidelines to your campaign’s unique targeting. If you need help, just send us a note. Targeting and ad group variables, like campaign flight time and the size of a custom audience, will greatly impact the CPMs needed to secure available ad inventory. In general, more narrowly-targeted ad groups will need a more aggressive bid in order to win factors such as the type of data, size of the user pool, site categories, and premium content of site lists. It’s important to set your bids accordingly to best maximize your digital advertising impact at the lowest cost. to increase your campaign efficiency. What is a base bid? Just like at an auction, a base bid is the starting point for where you would feel comfortable beginning your bid. If the system can win you an ad auction at a price point lower than your base bid, it will do so. Bid adjustments will take place automatically in the ad exchange between your base and max bids. What is a max bid? Max bids are the cap set on any bid you would be willing to have submitted on your behalf in the ad exchange auction for an open ad. Choozle recommends that your max bid is at least two times higher than your base bid. By setting your max bid higher, you enable your ad to win more impressions and have adjustments made within the auction environment. What are total and daily ad group budgets? The total ad group budget is the overall amount that can be spent in the duration of your campaign. The total of all the ad group budgets for the campaign should add up to the overall campaign budget and should not surpass the overall daily budget. 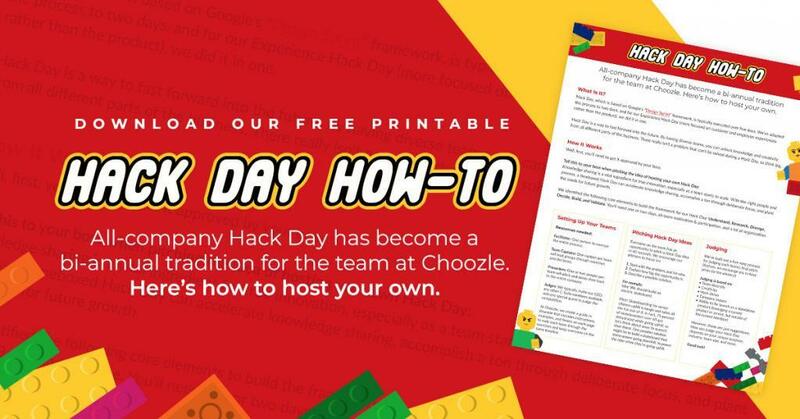 In Choozle, if you do not set an end date for the campaign, the campaign will run until the budget is exhausted. The daily ad group budget is an amount that you set for each ad campaign to specify how much, on average, you’d like to spend each day. The system will automatically evenly distribute your entire ad group’s budget when the daily budget is selected if you have a selected end date. If no end date is selected for the campaign, adding a daily group budget will enable your budget to not be used up if a high volume of impressions is possible. Different channels (don’t forget to do your research for your accompanying social media campaigns) and creative units can require different marketing CPM bid levels. To avoid wasting money, we recommend breaking out the following types into separate ad groups—display and video. Display typically requires the lowest bid CPM, while video requires the highest. Bids for retargeting campaigns can vary widely depending on the size of your user pool. If you have a very small user pool, you will need to bid more aggressively to win those users. As a starting point, set your max bid to at least twice your base bid to see where the price organically falls. Make adjustments as you go. Important note: This rule does not apply to native or video advertising. Native and video both start at higher CPMs, therefore doubling the base bid would create an incredibly high max bid, and with such a wide range between the base and max, the system would time out before the max is reached. 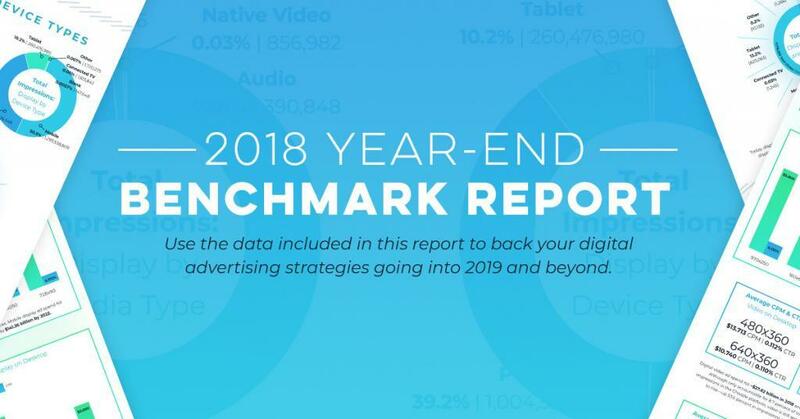 All in all, although there are several factors to winning available ad inventory, by setting smart CPMs, you’re that much closer to hitting your goals. Fill out the Impressions and Cost fields to calculate the CPM/eCPM of a campaign! Ready to launch? Download our campaign planner guide to read up on which strategies will help achieve your goal.